I love combining lemon and blueberry together. That is exactly what I did to make these Lemon Blueberry Donuts. In addition to adding lemon and blueberry, I also added a creamy coconut frosting. Coconut also goes very well with lemon and blueberry. You can never have too many donut recipes, right? Especially when they are healthy donut recipes. My kids were trying to sneak bites of these lemon blueberry donuts as I was trying to take the picture! The life of a food blogger mom! If you also like lemon and blueberry, you may also like my lemon blueberry ice cream or my lemon blueberry cookies. This healthy donut recipe is vegan and gluten free. I used fresh blueberries in my recipe, but I bet you could also use frozen blueberries. Just let them thaw before using in this recipe. I think this healthy donut recipe would also be good with strawberries or raspberries! 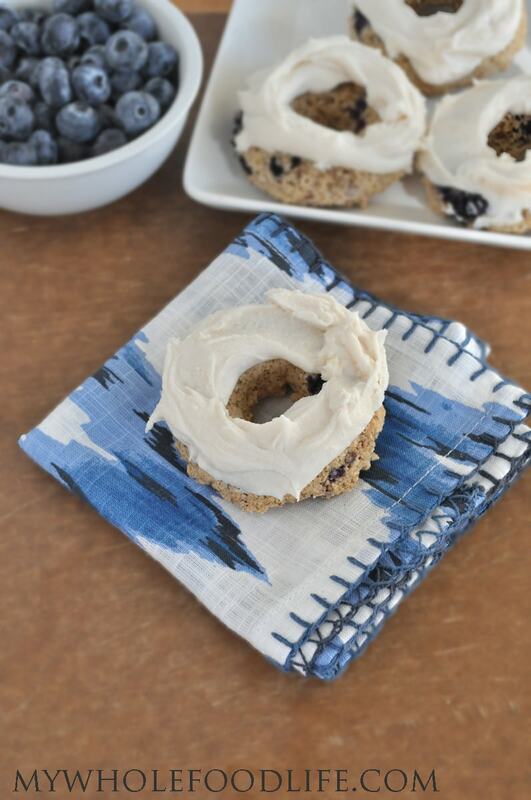 Healthy donuts bursting with the flavors of lemon and blueberry. Topped off with a coconut frosting! Bake for 10-14 minutes depending on your oven. Let the donuts cool completely before removing them and adding the frosting. In a food processor , combine the frosting ingredients and blend until smooth. Once the donuts are completely cool, spread on the frosting. Store these donuts in an airtight container in the fridge. They should last a week. If you want to freeze them, do so without the frosting. Enjoy! Time is running out to get our limited edition ebooks complete with shopping lists! Details here. Thanks Ally and thanks for pinning! We are not gluten free (so I don't have gluten free flour) - would I be able to use same ratio of whole wheat or buckwheat flour instead? Thanks so much for this great recipe!!! I think you can use the same ratio of whole wheat, but they may come out a bit more dense in texture. You can have too many donut recipes - when you don't have a donut pan!!! But I can't wait to try them as donut muffins! They will be delicious as muffins too. You may need to cook them a minute or two longer. MAybe almond flour if you add an extra egg? is the applesauce instead of an oil. how much sunflower oil would I replace the applesauce with? WOW! I've made the pumpkin chai donuts a couple of times and thought they were amazing, and have just found this recipe a few days ago & have just baked my 2nd batch of them (I did half the amount of maple syrup though). The kids adore them, I adore them, the people at my husbands work loved them too! They are so easy to make and so yum to eat! My 3yo & 6yo girls had a great time helping me make them this afternoon. My 8yo son asked 'are they healthy?' and was very excited when I said yes. I have just found the chocolate donut recipe so will need to try that next. Thank you!! I hope you enjoy the chocolate one too.